An immunoregulatory role of aryl hydrocarbon receptor (AhR) has been shown in conventional αβ and γδ T cells, but its function in skin γδ T cells (dendritic epidermal T cells [DETC]) is unknown. In this study, we demonstrate that DETC express AhR in wild-type mice, and are specifically absent in the epidermis of AhR-deficient mice (AhR-KO). We show that DETC precursors are generated in the thymus and home to the skin. Proliferation of DETC in the skin was impaired in AhR-KO mice, resulting in a >90% loss compared with wild type. Surprisingly, DETC were not replaced by αβ T cells or conventional γδ T cells, suggesting a limited time frame for seeding this niche. We found that DETC from AhR-KO mice failed to express the receptor tyrosine kinase c-Kit, a known growth factor for γδ T cells in the gut. Moreover, we found that c-kit is a direct target of AhR, and propose that AhR-dependent c-Kit expression is potentially involved in DETC homeostasis. DETC are a major source of GM-CSF in the skin. Recently, we had shown that impaired Langerhans cell maturation in AhR-KO is related to low GM-CSF levels. Our findings suggest that the DETCs are necessary for LC maturation, and provide insights into a novel role for AhR in the maintenance of skin-specific γδ T cells, and its consequences for the skin immune network. Recently, aryl hydrocarbon receptor (AhR), a ligand-activated transcription factor, has been recognized as an important factor in the differentiation and function of peripheral immune cells (1, 2). In the skin, a role for AhR as a sensor of chemicals and light has been demonstrated for keratinocytes, Langerhans cells (LC), melanocytes, and fibroblasts (2–6). However, nothing is known about the function of AhR for the epidermal resident T cell population, that is, γδ TCR+ T cells. These T cells account for almost 100% of epidermal lymphocytes, and are commonly known as dendritic epidermal T cells (DETC) (7). We had shown that levels of GM-CSF are very low in the epidermis of AhR-KO mice, and that LC maturation requires GM-CSF (3), which is a target of AhR (8, 9). DETC are a major source of GM-CSF and are pivotal in wound healing and tumor surveillance (10–14). Therefore, we decided to dissect its cell type-specific functions further by (conditional) gene targeting. In the mouse, γδ T cells preferentially reside in epithelia such as epidermis, gut, lung, or the genitourinary tract (15, 16); they are an immediate source of cytokines and chemokines upon Ag stimulation. DETC have a very limited TCR repertoire, and in mice most DETC belong to the Vγ3/δ1 clonotype (Vγ3+-DETC) (17–19). DETC are in constant contact with multiple neighboring keratinocytes and LC, integrating innate and adaptive immunity (20). Vγ3/δ1 T cells destined for the skin are generated and selected exclusively in the fetal thymus between embryonic days 15 and 18 (7, 21–23), and then migrate to the skin in an E/P selectin-dependent fashion (24), where they remain for life. In Vδ−/− mice, αβ TCR+ DETC seed the skin, but disappear with time (17), suggesting that the epidermal niche for T cells cannot be successfully occupied by conventional T cells. The exact nature of homeostatic proliferation and maintenance of γδ T cells in situ in skin is not known. AhR dependence of gene transcription is known for many genes, including genes of the immune system (8, 25), which bear the AhR-responsive element (ARE; also known as dioxin-responsive element) in their promoter (26). Recently, it was discovered that AhR interacts also with other signaling molecules, such as NF-κB, estrogen receptor, or STAT1 (27–29). As a consequence, AhR-mediated gene induction is highly context dependent and cell specific (30, 31). The intracellular abundance of AhR differs markedly between cells, even if they are closely lineage related, such as peripheral CCR6+ and CCR6− γδ T cells (32). Interestingly, keratinocytes, fibroblasts, LC, and melanocytes of the skin express AhR (3–6). Although not formally proven, it is generally assumed that physiological relevance correlates with expression levels. In this study, we report the seminal finding that DETC express AhR abundantly and were dramatically lost from skin in AhR-KO, but not in keratinocyte- or LC-specific conditional AhR-KO mice. As γδ T cells are a major source of GM-CSF, this might be related to impairment of LC maturation in AhR-KO mice (3). Moreover, we found that the lack of DETC is not compensated by other T cells in the AhR-KO mouse, indicating a restricted time window for colonizing the skin with intraepithelial lymphocytes. Fewer DETC of AhR-KO expressed c-Kit, a potential target of AhR. Together, our data establish an unexpected intrinsic role of AhR in Vγ3+-DETC survival and proliferation in the murine skin, possibly involving AhR-dependent expression of c-Kit. Ten- to 12-wk-old female wild-type (WT) C57BL/6 and congenic AhR-KO mice (33) were used. Keratinocyte-specific AhR-KO mice (K5AhR-KO) were described previously (5). LC specific (LangerinAhR-KO) were bred from AhRflox/flox and Langerin-Cre mice (generated by B.E.C. and S.P.Z., manuscript in preparation), and the LC specificity of AhR deletion was verified. For details see Supplemental Data 1. All experiments were in accordance with relevant German and Dutch animal welfare laws. Epidermal cell suspensions were prepared from ear, tail, or depilated back skin, as described (5). Briefly, dermis and epidermis were separated by trypsinization, and epidermal cells were released mechanically. Epidermal cells were cultivated in RPMI 1640 supplemented with 10% FCS, penicillin/streptomycin, and 0.15% NaHCO3. For flow cytometry or cell sorting, cell suspensions were cultivated for several hours, allowing re-expression of surface markers. Cell viability was not affected by this. CD3+ T cells were enriched with MACS (Miltenyi Biotec), and then sorted for vital CD3+ and γδ TCR+ (with GL3, a pan–anti-TCRγδ mAb) double-positive cells on a FACSCalibur (BD Biosciences) to a purity of >97%. For FACS analysis, cells were stained with the appropriate Abs (see Supplemental Data 1), after blocking FcRs with anti-CD16/32. Propidium iodide staining and scatter characteristics were used to exclude dead cells and doublettes. Data were analyzed with FlowJo 7.5 software (TreeStar). DETC are comprised of both GL3+Vγ3− (<5%) and GL3+Vγ3+ cells (>95%). In this work, we use the term Vγ3+-DETC cells to distinguish the latter. In multicolor fluorescence analysis, DETC were gated on γδTCR(GL3)+CD3+ cells, as shown in Fig. 1A, unless indicated otherwise. Epidermal cells were isolated, as described above, and cultured at 106 cells/ml in 12-well plates for 24 or 48 h. GM-CSF concentrations in the supernatants were determined by ELISA (eBioscience). Western blotting of sorted TCRγδ+/CD3+ cells (purity >97%) was done with standard procedures, using Biomol (catalog SA210) polyclonal rabbit anti-mouse AhR Ab and goat anti-rabbit Ab to develop. Loading was controlled with anti-GAPDH Ab clone 6C5 (Acris; Hiddenhausen). Epidermal sheets were fixed in acetone at −20°C for 20 min, followed by a blocking step (10% FCS/PBS for 1 h, room temperature). Sheets were stained with anti-Vγ3FITC and anti-MHCII overnight at 4°C, and then developed with goat anti-rat IgGTexasRed (Invitrogen) for 2 h at room temperature. Epidermal sheets mounted on glass slides were photographed and analyzed with a Leica DM2500 microscope (Leica) and AxioVision Rel.4.6 software (Zeiss). Cell cycle was analyzed by propidium iodide staining, and apoptotic cells were detected with TUNEL assay using the In Situ Cell Death Detection kit (Roche Applied Bioscience). Total RNA was isolated with TRIzol (Invitrogen), according to the manufacturer’s instructions, treated with DNase, and reversely transcribed with (dT)16 oligonucleotide primers. Quantitative PCR was performed on a Rotor-Gene RG 3000 (LTF Labortechnik). Amplification conditions were 45 cycles of denaturation (15 s at 94°C), primer annealing (20 s at 55°C [Cyp1A1], 56°C [AhR], and 60°C [IL-2, IL-7, IL-15, TNF-α], respectively), elongation (30 s [Cyp1A1, AhR] or 20 s [IL-2, IL-7 IL-15, TNF-α] at 72°C), and 2 s at 72°C for fluorescence detection. Expression levels were normalized with the ΔΔ cycle threshold method to Rps6, amplified from the same sample. Analysis of Scf expression levels was done by nonquantitative RT-PCR, with 38 cycles of 30 s at 94°C, 30 s at 60°C, and 90 s at 72°C. PCR products were analyzed by gel electrophoresis. All primer sequences are given in Supplemental Data 1. The mouse c-kit promoter (−396/−37) containing two ARE core sequences 5′-GCGTG-3′ (at −344 and −145) was subcloned into the luciferase reporter plasmid pGL3 basic vector (Promega). Mutations of ARE1 or ARE2 in c-kit (mut-1, mut-2) or both (mut1+2) were generated by site-directed mutagenesis with the QuikChangeII Site-Directed Mutagenesis kit (Stratagene), according to the manufacturer’s instructions. Mutations were verified by sequencing. The promoter region of cyp1a1 containing five DREs was used as reference control. HepG2 cells were transfected and then treated with 10 nM 2,3,7,8-tetrachlorodibenzo-p-dioxin dissolved in 0.1% DMSO or solvent for 24 h. Luciferase activities were determined by using the Dual-Luciferase Reporter Assay system (Promega) in a Multi-Bioluminate LB 9505C (Berthold Technologies). Firefly luciferase activity derived from the reporter plasmids was normalized to Renilla luciferase activity derived from cotransfected pRL-SV40 (Promega). Cloned sequences are shown in Supplemental Data 1. Data were analyzed with Student t test or one-way ANOVA. The p values <0.05 were considered to be significant. Means ± SD are shown. Recently, we found that GM-CSF is reduced in the skin of AhR-KO mice, and we suggested that lack of GM-CSF might be one reason for diminished LC maturation and function in these mice (3, 20). Because DETC are a major source of GM-CSF in the skin (12), we examined the presence of DETC populations in ear, back, and tail skin of AhR-KO mice by flow cytometry and immunohistochemistry. As demonstrated in Fig. 1, DETC were dramatically reduced in tail, back, and ear skin of AhR-KO (Fig. 1A, 1B), but not in the epidermis of conditional keratinocyte-specific AhR-deficient (K5AhR-KO) mice (Fig. 1B). Immunohistology showed that epidermal distribution pattern, morphology, and numbers/mm2 of Vγ3+-DETC remained normal in the epidermis (ears) of K5AhR-KO, as well as in the epidermis of conditional LC-specific AhR-deficient mice (LangerinAhR-KO) (Fig. 1C, Supplementary Data 2A). Except in the AhR-KO mice, Vγ3+-DETC formed a dense dendritic network with LC and keratinocytes. In both WT and AhR-KO mice, some Vγ2+ DETC were detectable, as has been described (34); these cells appear not to be lost in the AhR-KO (Table I). The overall thickness and morphology of the epidermal layer in AhR-KO mice were not impaired (Supplemental Data 2B). Interestingly, DETC were not replaced by αβ TCR+ T cells in AhR-KO mice; on average, we detected <0.5% TCRβ+ T cells in both WT and AhR-KO (Supplemental Data 2C). Surface expression levels of activation markers and IL-2R (CD122 β-chain) or IL-7R (CD127, α-chain) did not differ, except for expression of CD69 and c-Kit (CD117) (Table I; see also below). Frequencies and morphology of DETC. Epidermal cells were isolated from ear, back, or tail skin. Dead cells and doublettes were excluded by propidium iodide staining and scatter gate. A, Dot plot of WT versus AhR-KO epidermal cells. Numbers indicate percentages per all live epidermal cells. The gate used to determine γδTCR+CD3+ cells is indicated by the oval circle. B, Frequencies of Vγ3+ within the γδTCR+CD3+ cells prepared from different skin regions of WT (black bars), AhR-KO (white bars), and K5AhR-KO mice (gray bars). Data are representative of at least three independent experiments. **p < 0.01 by ANOVA. C, Immunohistological photographs of epidermal sheets of WT (a, original magnification ×400; c, original magnification ×200), AhR-KO (b, original magnification ×400; d, original magnification ×200), K5AhR-KO (e, original magnification ×400), and LangerinAhR-KO (f, original magnification ×400). Sheets were stained with anti-Vγ3FITC and anti–I-A/I-ETexasRed. IL-2 protein in 24-h supernatants, or IL-7, IL-15, and TNF-α mRNA levels of freshly isolated epidermal cells, all of which are relevant for γδ T cell homeostasis (12), did not differ between epidermal cell suspensions from WT, AhR-KO, and K5AhR-KO mice (Supplemental Data 2D, 2E). These data suggest that the lack of DETC is neither due to an AhR-dependent impairment of paracrine cytokine secretion by keratinocytes or LC, nor to a failure to express the respective cytokine receptors by the DETC. Vγ3/δ1 T cells are generated exclusively during a short period in the fetal thymus (7, 35). We therefore analyzed the frequency and absolute numbers of Vγ3+ cells in thymi from embryonic days 15–17. In agreement with our previous observations (36), total cell numbers were reduced in the fetal thymus of AhR-deficient mice, mainly due to a decrease in CD4+CD8+ double-positive cells (Fig. 2A, Supplemental Data 2F). However, despite a possible drop in Vγ3+ cells in AhR-KO at day 17, neither frequencies (Fig. 2B, 2C) nor absolute numbers (Fig. 2D) of Vγ3+ cells differed significantly between WT and AhR-KO on days 15–17. It is thus unlikely that a failure to generate DETC precursors in the thymus is the underlying cause of DETC absence in adult AhR-KO mice. γδ T cells in the fetal thymus. Thymus cell suspensions from embryonic days (ED) 15–17 were prepared, stained for γδTCR (GL3+) and Vγ3+ cells, and analyzed by FACS after gating on live cells. A, Thymocyte numbers from thymi of 5–17 individual mice ± SD; B, representative dot plot of γδ TCR/Vγ3 staining (ED16). C, Frequencies of total γδ TCR+ cell precursors from WT and AhR-KO mice (upper curves, right ordinate) and γδ TCR+/Vγ3+ double-positive WT and AhR-KO cells (lower curves, left ordinate). D, Absolute numbers of γδ TCR+Vγ3+, calculated from the respective frequencies above, and thymocyte numbers. n = 3–9 individual mice, ***p < 0.001 with Student t test. Thymus-generated Vγ3+ T cells home to the skin. We asked whether skin homing is intact in AhR-KO mice and investigated for the presence of Vγ3+-DETC in the dermis and epidermis of newborn mice between days 2 and 28 after birth. We found no accumulation of Vγ3+-DETC in the dermis of AhR-deficient mice, indicating that they are not retained in the dermis (Supplemental Data 3A). Vγ3+-DETC were detectable in the epidermis in WT and AhR-KO mice at day 2 after birth. Note that at this time point the frequency of Vγ3+-DETC was even higher in AhR-KO mice than in WT mice (Fig. 3A, inset). The frequencies increased in WT, peaked at day 14, and reached adult levels of ∼5–8% at the age of 4 wk. In contrast, Vγ3+-DETC steadily decreased in AhR-KO mice after day 2 (Fig. 3A). The frequencies of Vγ3+-DETC of heterozygote littermates were the same as in WT (Supplemental Data 3B). Thus, Vγ3+ T cells were generated in the embryonic thymi of AhR-KO mice and found resident in the epidermis shortly after birth at equal or even higher numbers, then lost from the skin within a few weeks. In addition, Vγ3+-DETC of AhR-KO mice did not undergo normal morphological changes after birth, that is, retained distinct round shapes and few dendrites (dendrites/cell: 2 versus 1.7 on day 7, and 3.3 versus 1.6 on day 14 in WT versus AhR-KO, respectively; day 7, no significant difference; day 14, p = 0.0095; see Fig. 3B), conceivably indicating impaired differentiation and possibly occupation of the epidermal niche. Kinetics of DETC in the epidermis of newborn mice. Epidermal cells from mice were prepared at the indicated age and analyzed flow cytometrically. A, Frequencies of γδTCR+/Vγ3+ in epidermal cells. Mean ± SD from four to seven individual mice/time point. A, Inset, Frequencies of γδ TCR+/Vγ3+ cells on days 2 and 7 after birth. B, Morphology of DETC (stained with anti-Vγ3FITC, white arrows) in epidermal sheets of WT at days 7 (a) and 14 (c) and AhR-KO mice at days 7 (b) and 14 (d). C, Histograms of expression intensity of Vγ3+ on γδTCR+CD3+ gated live cells in epidermis; *p < 0.05, **p < 0.01, ***p < 0.001 with Student t test. The results shown in Fig. 3A indicate a failure of AhR-KO DETC to proliferate adequately. Congruent with this, we detected ∼5% more cycling cells in AhR+/− than in AhR-KO on both days 7 and 10 after birth (Table II; note that, as shown in Supplemental Data 3, AhR+/− have Vγ3 cell density like WT). A difference in frequency of apoptotic DETC, measured by TUNEL staining, was not detectable (Supplemental Data 3C). Surprisingly, inhibition of proliferation appeared to affect Vγ3 cells only (Fig. 3C, compare the shift in Vγ3pos and Vγ3neg cells). Our data demonstrate that AhR deficiency results in incapacity of DETC to adopt their dendritic morphology, and proliferate adequately after successful primary seeding of the skin. Together, this eventually leads to the loss of these cells shortly after birth. We had previously shown that the tyrosine kinase and growth factor c-Kit (CD117) are absent in AhR-KO melanocytes, which correlated with a reduced capacity of UV-induced proliferation of these cells (5). c-Kit is also known to regulate activation and expansion of intraepithelial lymphocytes in the gut, many of which are γδ T cells (37). We found that γδ TCR+ intraepithelial lymphocytes were reduced by 50% in AhR-KO mice, but frequencies of γδ T cells in blood or spleen did not differ between AhR genotypes (Supplemental Data 3D, 3E). It is known that the ligand of c-Kit, stem cell factor (SCF), is secreted by epidermal cells (38). We therefore hypothesized that SCF/c-Kit signaling might be affected by AhR deficiency. Indeed, the frequency of c-Kit–expressing Vγ3+-DETC cells was reduced in AhR-KO mice, but not WT or K5AhR-KO mice, indicating an intrinsic regulation of c-Kit (Fig. 4A, see also Table I). There were no differences in the amount of soluble SCF or membrane-bound SCF in epidermal cells of WT, K5AhR-KO, or AhR-KO mice (Fig. 4B). 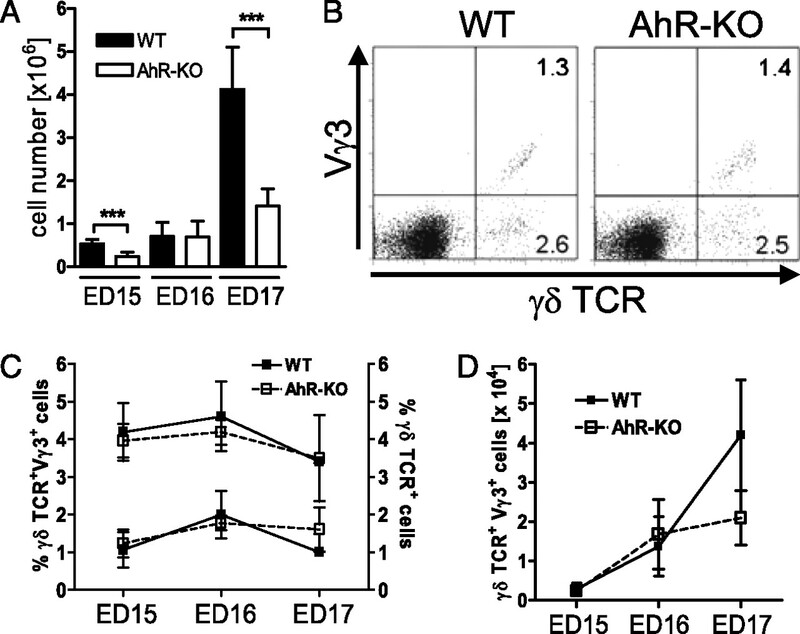 c-kit harbors two AREs in its promoter (8), and DETC express AhR (Fig. 4C). We cloned the promoter fragment covering these AREs (Supplemental Data 1) into a luciferase reporter vector. Treatment of transfected hepatoma (HepG2) cells with the strong AhR agonist 2,3,7,8-tetrachlorodibenzo-p-dioxin induced luciferase expression, which was reduced when point mutations were introduced into either of the two ARE, and abrogated, when both AREs were mutated (Fig. 4D). Together, these results demonstrate that c-kit can be a direct target for AhR-mediated transcription, and suggest that c-Kit expression is needed for Vγ3+-DETC maintenance. AhR-dependent c-Kit expression. A, Flow cytometric analysis of c-Kit (CD117) and Vγ3 expression on epidermal γδTCR+CD3+ cells from WT, AhR-KO, and K5AhR-KO mice. Epidermal cells were cultivated for 24 h prior to FACS analysis to allow re-expression of CD117 after trypsinization. Vγ3 cells were counterstained before and after the experiment with propidium iodide to control for cell viability (data not shown). Depicted is one of two representative experiments with at least three individual mice. B, RNA expression levels of soluble SCF (sSCF) and membrane-bound SCF (mSCF), determined by RT-PCR from epidermal cells of WT (lanes 1 and 2), AhR-KO (lanes 3 and 4), and K5AhR-KO (lanes 5 and 6) mice, compared with Rps6 housekeeping gene amplified from the same samples. Each lane shows the result for one individual mouse. C, Western blot detection of AhR and GAPDH in protein extracts of γδTCR+CD3+ T cells, sorted to >97% purity. D, Bar graph showing relative units of luminescence (RUL) after transfection with indicated reporter plasmids. One representative experiment of three is shown (three replicates, mean ± SD). Statistical significances were calculated by ANOVA (**/##p < 0.01; ***/###p < 0.001). Mice from the TCRδ-deficient strain FVB have an increased ear thickness and spontaneous dermatitis (13), but TCRδ-deficient C57BL/6 mice do not (39). In agreement with this, we observed no pathological skin phenotype such as skin lesions or thickening of the epidermis in our AhR-deficient C57BL/6 mice (see Supplemental Data 2B). However, we recently reported that LC from AhR-KO mice were impaired in maturation and expressed significantly lower levels of CD80 due to reduced GM-CSF levels in epidermal cells (3). We cultured WT, K5AhR-KO, or AhR-KO epidermal cells and determined GM-CSF levels in the respective supernatants. As shown in Fig. 5A, GM-CSF levels were significantly reduced in AhR-KO epidermal cells compared with both WT and K5AhR-KO. The increase in the amount of GM-CSF in AhR-KO culture supernatants between 24 and 48 h of culture could have been produced by the few remaining γδ T cells. Epidermal cells from K5AhR-KO mice produced normal levels of GM-CSF, indicating that the reduction in GM-CSF in AhR-KO mice is the result of reduced γδ T cells (Fig. 5A). LC from WT epidermal cell cultures depleted of DETC displayed lower levels of the maturation marker CD80 (Fig. 5B) and lower mean scatter characteristics (Fig. 5C), both parameters of immature LC (3). Together, our data indicate that low GM-CSF levels in AhR-KO skin are due to the lack of DETC. Depletion of γδ T cells from epidermal cells reduces GM-CSF levels and affects LC maturation. A, GM-CSF levels in supernatants (24/48 h) of cultivated epidermal cells from WT (black bars), AhR-KO (white bars), and K5AhR-KO (gray bars), or epidermal cells from WT and K5AhR-KO depleted of γδ T cells by MACS. Shown is one of two representative experiments. n = 3 individual mice. Statistical significances were calculated by ANOVA (**p < 0.01, undepleted versus γδ T cell-depleted epidermal cells; #p < 0.05, AhR-KO versus WT and K5AhR-KO epidermal cells). B and C, Bar graph depicting the frequency of WT MHCII+ LC expressing CD80 (B) or their mean scatter characteristics (C) after 48 h of epidermal cell culture. n = 3 mice (**p < 0.01, ***p < 0.001 with Student t test). γδ T cells are a rare subset of T cells and can be separated into peripheral γδ T cells with a highly diverse TCR repertoire and the epithelial subsets with site-specific invariant TCRs. A pivotal role of AhR for the antimicrobial response of peripheral γδ T cells has recently been shown (32). In this study, we report the unexpected finding that invariant epidermal γδ T cells are virtually absent in the skin of AhR-deficient mice. Whereas γδ T cells, destined for the periphery, are generated in the thymus throughout life, invariant epidermal γδ T cells are generated exclusively during a short time window in the fetal thymus. Albeit we had shown previously that fetal γδ T cell development was affected by unphysiological persistent activation of AhR with 2,3,7,8-tetrachlorodibenzo-p-dioxin (40), we establish in this study that AhR presence is not required per se for normal generation of embryonic γδ T cells. Rearrangement of the Vδ genes during the double-negative stage in the thymus is regulated and controlled by recombination signals (34). Apparently, AhR activation, rather than needed, must be avoided in the fetal thymus for normal γδ T cell development to occur. An effect of AhR on the positive selection of future DETC, for example, via expression changes in the selection gene Skint1 (22), is also unlikely because Vγ3+ cells were detectable in the fetal thymus and able to emigrate. We detected homing to the epidermis to levels equal to that of WT mice, indicating that skin-homing signals such as CCR10/CCL27 (41) were not targeted by AhR. Confirming published data, we observed a proliferative burst of Vγ3+-DETC cells in the epidermis of WT mice between days 7 and 14 after birth, followed by a decline until adult frequencies were reached 28 d (42). In contrast, no proliferative burst was detectable in Vγ3+-DETC from AhR-KO mice, which steadily declined in the epidermis, and had ∼5% fewer cycling cells compared with WT. Assuming a cell cycle duration of ∼12–16 h, even this small difference in percentage of cycling cells would translate into several-fold higher frequencies of WT Vγ3+-DETC seen on day 14. Other factors might exacerbate the loss of DETC from the epidermis. DETCs exhibit a dendritic morphology, allowing them contact with many different keratinocytes simultaneously and providing keratinocytes with viability and survival factors such as insulin-growth factor-1, as shown in Vδ−/− mice (10). DETC of AhR-KO had an altered morphology, that is, they did not properly form dendrites after homing to the skin. It is possible that this is associated with an altered ability to establish the necessary cell–cell contacts in the epidermis. This notion is congruent with fewer DETC expressing CD69, that is, having an unusual nonactivated state (43). In contrast to the Vδ−/− mouse model of DETC deficiency, we did not observe a notable increase in epidermal apoptosis structure in AhR-deficient mice (10). The reasons for this discrepancy are currently unclear. Notably, in AhR-KO mice, the missing Vγ3+-DETC were not replaced, neither by αβ T cells nor by other γδ T cells. Such reconstitution has been described for TCRδ−/− mouse strains, albeit αβ T cells were lost again with time (11, 44). Again, this might be due to the unique ability of DETC to contact closely the surrounding keratinocytes and LC via their dendrites. This unexpected finding reflects that there is a window for T cell seeding of the epidermis, and suggests that an empty epidermal γδ T cell niche cannot be filled successfully with non-γδ T cells once this opportunity has passed. This has to be considered in situations in which reconstitution of DETC cells is therapeutically desirable. Keratinocytes respond to AhR activation, and many DETC growth factors secreted by keratinocytes harbor AREs in their promoters (45). However, we have ruled out such paracrine AhR dependency, as epidermal sheets from K5AhR-KO mice (5) contained normal Vγ3+-DETC. Similarly, putative AhR-dependent factors from LC seem irrelevant for DETC homeostasis, as evident from the results in LangerinAhR-KO mice. In addition, IL-7 and IL-15 mRNA levels were similar in epidermis from WT, AhR-KO, and K5AhR-KO mouse strains. Together, these findings point to an intrinsic requirement for AhR regarding the homeostasis of γδ T cells. Which other factors could be relevant in the homeostasis of DETC? Recently, we reported that melanocytes of AhR-deficient mice fail to express c-Kit, and consequently did not proliferate well in response to UVB irradiation (5). With regard to γδ T cells, c-Kit and its ligand SCF have been described as necessary growth factors for intraepithelial γδ T lymphocytes in the gut (46). Congruent with a role for AhR in c-kit expression, gut-specific γδ T cells were reduced by 50% in AhR-deficient mice. As we demonstrate in this study, a much smaller proportion of the few remaining Vγ3+-DETC in the epidermis of AhR-deficient mice still expressed c-Kit. Moreover, we show that c-kit has functional AREs. Endogenous AhR ligands are available in the skin, and could conceivably drive c-Kit–dependent homeostasis (4). The c-kit gene is differentially expressed in cell lineages and in developmental stages (47). Mice with spontaneous mutations in the W locus (i.e., c-kit locus) demonstrated the role for c-kit in germ cells, melanocytes, neural cells, and the hematopoietic lineage (48). In the W/Wv mice, a point mutation results in aberrantly spliced c-kit transcripts, putatively expressed in a tissue-specific manner (49). Interestingly, Puddington et al. (46) showed that in W/Wv mice the frequency of Thy1+GL3+ epidermal cells (i.e., DETC) was comparable to control mice, whereas frequencies of gut intraepithelial lymphocytes were reduced. The authors did not test for c-Kit (or Vγ3) expression on these cells, and the difference from our findings in AhR-KO mice could be due to the tissue-specific penetrance of the mutation. To our knowledge, we report in this work expression of c-Kit on Vγ3+-DETC for the first time. γδ T cells are also found in human epidermis, together with αβ T cells (50); similar to mice, their functional capabilities and homeostasis are not fully understood, but evidence suggests that they share biological roles in immunosurveillance and wound healing (43, 51, 52). Information gained on DETC in mice may provide new insights into their human counterparts. There are implications of our findings for skin allergies and wound healing, in particular as AhR activity is amenable to modulation by small chemicals. First, our finding of the relevance of DETC cell-produced GM-CSF for LC maturation might be used to manipulate LC cells in allergic reactions. Second, our identification of c-kit as a target of AhR and as an additional player in DETC homeostasis could be exploited using AhR agonists in the manipulation of c-Kit–related cancers, including melanoma or mastocytoma. In aggregate, we present the novel finding that DETC homeostasis depends on AhR expression in DETC, and we suggest adding c-Kit as a possible target molecule for AhR-dependent proliferation of DETC. We thank Babette Martiensen and Swantje Steinwachs for expert technical help. This work was supported by Deutsche Forschungsgemeinschaft Grant GK1427, The Netherlands Organization for Scientific Research Grant VIDI 917-76-365 (to B.E.C. ), and Landsteiner Foundation for Blood Transfusion Research Grant 0414F (to B.E.C.) for the generation of Langerin-Cre mice.
. 2009. The aryl hydrocarbon receptor in immunity. Trends Immunol. 30: 447–454.
. 2011. External influences on the immune system via activation of the aryl hydrocarbon receptor. Semin. Immunol. In press.
. 2007. Lightening up the UV response by identification of the arylhydrocarbon receptor as a cytoplasmatic target for ultraviolet B radiation. Proc. Natl. Acad. Sci. USA 104: 8851–8856.
. 2011. The aryl hydrocarbon receptor mediates UVB radiation-induced skin tanning. J. Invest. Dermatol. 131: 203–210.
. 2009. Loss of dioxin-receptor expression accelerates wound healing in vivo by a mechanism involving TGFbeta. J. Cell Sci. 122: 1823–1833.
. 2007. Development and selection of gammadelta T cells. Immunol. Rev. 215: 15–31.
. 2004. Comparative analysis of dioxin response elements in human, mouse and rat genomic sequences. Nucleic Acids Res. 32: 4512–4523.
. 1995. Effect of 2,3,7,8-tetrachlorodibenzo-p-dioxin on anti-CD3-induced changes in T-cell subsets and cytokine production. Int. J. Immunopharmacol. 17: 951–961.
. 2005. Dendritic epidermal T cells regulate skin homeostasis through local production of insulin-like growth factor 1. Nat. Immunol. 6: 73–79.
. 2007. Skin gammadelta T-cell functions in homeostasis and wound healing. Immunol. Rev. 215: 114–122.
. 1996. Cytokine-mediated communication between dendritic epidermal T cells and Langerhans cells: in vitro studies using cell lines. J. Immunol. 157: 1529–1537.
. 2006. Environmentally responsive and reversible regulation of epidermal barrier function by gammadelta T cells. J. Invest. Dermatol. 126: 808–814.
. 2001. Regulation of cutaneous malignancy by gammadelta T cells. Science 294: 605–609.
. 1985. Structure, organization, and somatic rearrangement of T cell gamma genes. Cell 40: 259–269.
. 2007. gammadelta T cells: firefighters or fire boosters in the front lines of inflammatory responses. Immunol. Rev. 215: 103–113.
. 2004. A keratinocyte-responsive gamma delta TCR is necessary for dendritic epidermal T cell activation by damaged keratinocytes and maintenance in the epidermis. J. Immunol. 172: 3573–3579. 2009. Gammadelta T cells and the lymphoid stress-surveillance response. Immunity 31: 184–196.
. 1986. Diversity, rearrangement, and expression of murine T cell gamma genes. Cell 45: 733–742.
. 1996. Cytokine-mediated communication by keratinocytes and Langerhans cells with dendritic epidermal T cells. Semin. Immunol. 8: 333–339.
. 1997. Events that regulate differentiation of alpha beta TCR+ and gamma delta TCR+ T cells from a common precursor. Semin.Immunol. 9: 171–179.
. 2008. Skint1, the prototype of a newly identified immunoglobulin superfamily gene cluster, positively selects epidermal gammadelta T cells. Nat. Genet. 40: 656–662.
. 2006. Developmental and molecular characterization of emerging beta- and gammadelta-selected pre-T cells in the adult mouse thymus. Immunity 24: 53–64.
. 2010. Embryonic trafficking of gammadelta T cells to skin is dependent on E/P selectin ligands and CCR4. Proc. Natl. Acad. Sci. USA 107: 7443–7448.
. 1996. Ah receptor signaling pathways. Annu. Rev. Cell Dev. Biol. 12: 55–89.
. 2003. Activation of the aryl hydrocarbon receptor by structurally diverse exogenous and endogenous chemicals. Annu. Rev. Pharmacol. Toxicol. 43: 309–334.
. 2007. RelB, a new partner of aryl hydrocarbon receptor-mediated transcription. Mol. Endocrinol. 21: 2941–2955.
. 2000. Mechanisms of inhibitory aryl hydrocarbon receptor-estrogen receptor crosstalk in human breast cancer cells. J. Mammary Gland Biol. Neoplasia 5: 295–306.
. 2000. The murine IL-2 promoter contains distal regulatory elements responsive to the Ah receptor, a member of the evolutionarily conserved bHLH-PAS transcription factor family. J. Immunol. 165: 6975–6983.
. 1996. Characterization of a murine Ahr null allele: involvement of the Ah receptor in hepatic growth and development. Proc. Natl. Acad. Sci. USA 93: 6731–6736.
. 2009. Recombination signal sequence-associated restriction on TCRdelta gene rearrangement affects the development of tissue-specific gammadelta T cells. J. Immunol. 183: 4931–4939.
. 1988. Developmentally ordered appearance of thymocytes expressing different T-cell antigen receptors. Nature 335: 443–445.
. 1999. Thymocyte development in Ah-receptor-deficient mice is refractory to TCDD-inducible changes. Int. J. Immunopharmacol. 21: 841–859.
. 2000. Stem cell factor (SCF) can regulate the activation and expansion of murine intraepithelial lymphocytes. Cytokine 12: 272–280.
. 2009. Physiological factors that regulate skin pigmentation. Biofactors 35: 193–199.
. 2002. Resident skin-specific gammadelta T cells provide local, nonredundant regulation of cutaneous inflammation. J. Exp. Med. 195: 855–867.
. 2005. Detection of a novel population of fetal thymocytes characterized by preferential emigration and a TCRgammadelta+ T cell fate after dioxin exposure. Int. Immunopharmacol. 5: 1659–1674.
. 2010. CCR10 is important for the development of skin-specific gammadeltaT cells by regulating their migration and location. J. Immunol. 185: 5723–5731.
. 2002. Developmental and functional defects of thymic and epidermal V gamma 3 cells in IL-15-deficient and IFN regulatory factor-1-deficient mice. J. Immunol. 168: 6486–6493.
. 2010. Epidermal T cells and wound healing. J. Immunol. 184: 5423–5428.
. 1996. Resistance to cutaneous graft-vs.-host disease is not induced in T cell receptor delta gene-mutant mice. J. Exp. Med. 183: 1483–1489.
. 1996. Identification of dioxin-responsive elements (DREs) in the 5′ regions of putative dioxin-inducible genes. Chem. Biol. Interact. 100: 97–112.
. 1994. Interactions between stem cell factor and c-Kit are required for intestinal immune system homeostasis. Immunity 1: 733–739.
. 1995. Identification of the control regions for mouse c-kit gene transcription induced by retinoic acid. DNA Res. 2: 211–218.
. 1990. The mouse W/c-kit locus. Ciba Found. Symp. 148: 158–166, discussion 166–172.
. 1991. Exon skipping by mutation of an authentic splice site of c-kit gene in W/W mouse. Nucleic Acids Res. 19: 1267–1271.
. 1990. T-cell receptor-gamma/delta bearing lymphocytes in normal and inflammatory human skin. J. Invest. Dermatol. 94: 764–768.
. 2009. A role for human skin-resident T cells in wound healing. J. Exp. Med. 206: 743–750.